Street Food stalls are fast becoming as quintessentially London as chimney sweeps, expensive pints and the Routemaster. There’s nary an area without some form of street food available within walking distance, so London Calling thought we’d let you know some of our favourites. Supplying hungry Londoners for over 1,000 years (! ), Borough Market is the original and still one of the best. Local suppliers are in abundance, they’ve adopted a superb approach to sustainability and, with stalls like Bermondsey’s raclette masters Kappacasein, delicious and healthy Egyptian fare from Koshari and famous vegetarian Indian Gujarati Rasoi, top notch street food abounds. Here’s to 1,000 more years! Borough Market can be found at 8 Southwark Street, SE1 1TL, and is open Mon-Thu 10am – 5pm, Friday 10am – 6pm and Saturday 8am – 5pm. Although Berwick Street Market has been going for a mere 239 years, it nonetheless has a rich history of satisfying hungry Soho visitors. Fayz Hamidi specialise in Afghan Street Food, Jerusalem Falafel is one of the best wraps you’ll find anywhere in London and for something a little healthier, but no less filling, Savage Salads is your stall. Berwick Street Market can be found on Berwick Street, Soho, from Monday to Friday, 8am – 6pm. 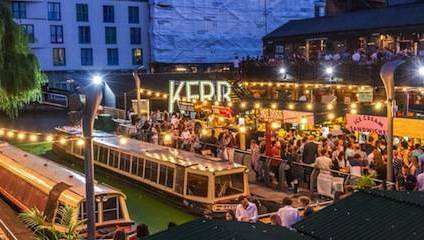 Symbolising the city’s insatiable appetite for street food, KERB are as synonymous with gourmet offerings as Camden Market is for variety and atmosphere. So a meeting of the two – KERB’s first permanent offering – makes total sense. The food is of a very high standard, and rotates regularly, but right now we’d highlight the Indonesian melting pot that is Makatcha, Venezualan tacos from the Areza Bros and sweet treats from the South East Cakery. KERB Camden Market can be found at Camden Market, and is open Monday to Thursday from 11am – 6pm, and Friday to Sunday from 11am – 7pm. Boasting a fine balance of historic merchants and funky food stalls, and surrounded by a gorgeous Victorian railway viaduct, Maltby Street Market oozes atmosphere. The infamous Sub Cult can be found serving up jam-packed gourmet sandwiches, Herman ze German supply the finest German sausages in London and The Cheese Truck’s ridiculously good toasties never get old. Maltby Street Market can be found at 41 Maltby Street, Southwark, on Saturday from 9am – 4pm and Sunday from 1am – 4pm. Another newbie, also with fantastic sustainability and community credentials, Mercato Metropolitano is a food haven. There’s a garden, a shop, regular events and, of course, a wide variety of stalls. Tortellino & Co. provide beautifully fresh pasta, Fresco deliver another Italian staple with generously topped pizzas, and to round off the Mediterranean theme, try the award-winning gelato from Badiani. Mercato Metropolitano can be found at 42 Newington Causeway, Southwark, and is open Tuesday to Saturday from 11am – 11pm and Sunday from 11am – 10pm.